Scientists have found cosmic dust for the first time in urban places, on rooftops in three of the world's major cities. “When Jon first came to me I was dubious. Many people had reported finding cosmic dust in urban areas before, but when they were analysed scientists found that these particles were all industrial in origin. Cosmic dust is made up of left over particles that have been around since the formation of our solar system. These particles are tiny, roughly around 0.01 millimetres in size, and have been falling to Earth since it was formed billions of years ago. Analysing their chemical and mineral content can tell scientists about how the early solar system has evolved. Most dust is collected by scientists from the frozen wastes of places like Antarctica, as it was thought too difficult to unearth these little time capsules in urban debris. For a new study, Dr Matthew Genge from Imperial College London teamed up with Jon Larsen, an amateur scientist from Norway, to sift through 300 kilograms of sediment that was trapped in gutters on roofs in Paris, Oslo and Berlin. Cosmic dust particles contain minerals that make them magnetic, so they used magnetism to separate the particles under the microscope, finding 500 of them in the debris. The samples analysed show the comparatively big cosmic dust that have recently, in geological terms, fallen on Earth. In 2011, Larsen contacted Dr Genge to say he believed it was possible to find to find cosmic dust particles in an urban landscape such as cities. Dr Genge, from the Department of Earth Science and Engineering at Imperial College London, said: “When Jon first came to me I was dubious. Many people had reported finding cosmic dust in urban areas before, but when they were analysed scientists found that these particles were all industrial in origin. Fastest dust particles on Earth? 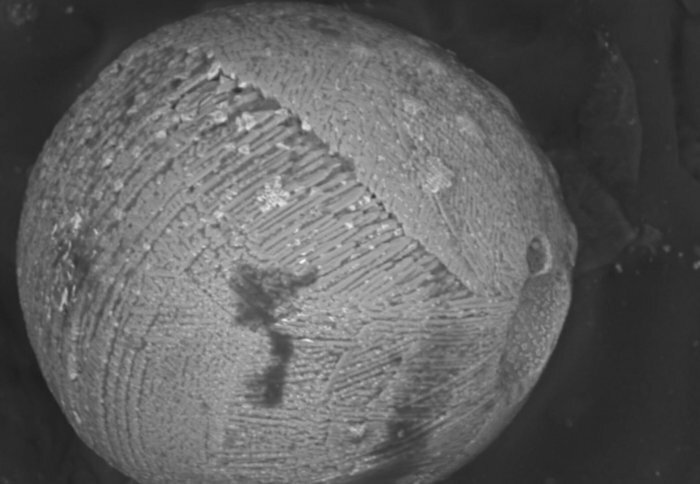 In the study, which is published in the journal Geology, the team report that the cosmic dust particles that they recovered from roof tops are larger than other particles previously recovered, at around 0.3 millimetres. Based on the particles’ size, the researchers’ analysis suggests they were formed by melting during atmospheric entry at speeds of around 12 km per second. Dr Genge says this would make them the fastest moving dust particles found on Earth. The new study also suggests that the dust arriving on Earth has changed over the last million years. The cosmic dust found in cities contains fewer feather-like crystals than old cosmic dust from Antarctica, which has accumulated in ice over the last million years. However, it is similar to cosmic dust that fell on Earth during medieval times. Dr Genge thinks the difference in cosmic dust particles results from changes in the orbits of planets in the Solar System. Over millions of years the orbits of planets like Mars and the Earth vary slightly. This causes a disturbance in the gravity they exert and this influences the trajectory of the microscopic particles as they hurtle through space. In turn, it affects how fast the cosmic dust plummets through the atmosphere, and how much it is heated, which causes crystals that grew in cosmic dust to adopt different shapes, revealing the amount of heating. This study was done in collaboration with researchers from the Natural History Museum, London, UK, and Project Stardust, Oslo, Norway.